This may appear similar to self-biasing as seen with JFET amplifier circuits, but it is not. 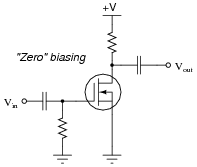 Zero biasing only works with IGFET amplifier circuits. Explain why this is so. 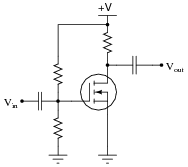 The natural Q-point of a depletion-type IGFET occurs with a gate-to-source voltage of 0 volts. This is very different from either bipolar junction (BJT) or junction field-effect (JFET) transistors. Follow-up question: will "zero" biasing work with enhancement-mode IGFETs as well? Explain why or why not. This question provides students with an opportunity to review IGFET theory, and to differentiate between depletion-mode and enhancement-mode types, which is a subject of much confusion among students new to the topic. How do you think the performance of these two differently-biased circuits compare? Assuming they were both biased for the same Q-point, would there be any significant difference(s) in their signal amplifying performance? Why or why not? One of these circuits has the potential for much greater voltage gain. I'll let you determine which one, and more importantly, why. This question is a good test of your students' comprehension of feedback in transistor circuits: what it is, what causes it, and what its effects are. 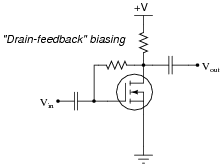 Ask your students whether they think the technique of drain-feedback biasing would work in a depletion-mode IGFET amplifier circuit.